The 40th anniversary of Star Wars dominated Star Wars Celebration Orlando this month. In fact, a celebration of 40 years kicked off the convention. George Lucas, Warwick Davis, Mark Hamill, Hayden Christensen, Harrison Ford and many others recounted the history of Star Wars from 1977 to the present and began the conversation from the Galaxy Stage. Naturally, this lead to many conversations about the best and favorite Star Wars moments from the past 40 years. One of my most favorite moments was the release of the Star Wars: Special Editions. I’m certain this is a controversial pick. Many fans hate the changes made to the classic movies. However, I have many reasons for celebrating the 20th anniversary of the special editions. For now, I’ll focus on two, which include a personal reason and a content addition. The personal reason is simple. I asked my wife to marry me on January 31, 1997. To make a long story short, we were between apartments as we waited for our new place to become available. While we waited, we were staying at my parents’ house. I’ll forever be grateful that my family supported us, but we were short on space and privacy. The move was unexpected at the time. I had recently ordered an engagement ring. It just happened to be ready on, you guessed it, January 31. I hadn’t planned on proposing that day, and we had tickets to the special edition release of A New Hope. There was no way I could go the entire weekend with the ring in my pocket. I had no place to hide it. So, a celebration of the return of Star Wars also became a celebration of our engagement as well. When it comes to content additions, the changes from the special editions resonate differently for many fans. Some dislike the changes. Among the reasons listed are a perceived bloating of the movies with additional special effects, interference with nostalgia, and story changes (e.g. Han no longer shoots first). As for myself, I like the changes overall to A New Hope. I could have done without Han shooting second. I liked the addition of Jabba the Hutt to the film by inserting previously cut footage enhanced with computer effects. Although, Han stepping on his tail seemed a little clumsy. The additions to Mos Eisley and the Battle of Yavin were welcome enhancements to me that brought A New Hope up to par visually with the prequels that would follow a few years later. Speaking of the prequels, that brings me to perhaps one of my most favorite content additions. Jabba the Hutt wasn’t the only classic character added to the scene in Docking Bay 94. The special editions added the most famous bounty hunter in the galaxy too. Boba Fett acts as another piece of Jabba’s muscle among a gang of ruffians surrounding the Millennium Falcon. I’m fond of this addition for a couple of reasons. Prior to the release of the special editions, Boba Fett was only present for The Empire Strikes Back and Return of the Jedi. However, he had a reputation, perhaps from the expanded universe, as being one of Jabba’s most favored enforcers and bounty hunters. Therefore, his inclusion in the Docking Bay 94 confrontation made sense. He is also one of the coolest looking characters in a cast of cool looking characters in Star Wars. Despite that, he gets precious little screen time in the second and third movies of the trilogy. When the special edition of A New Hope debuted, fans only had the original trilogy. Boba Fett was cool because of his look and his mystique. Nobody knew too much that was official about him. When he appeared on the screen, and then nodded to the camera as Jabba and his henchmen left the hangar, it was a fun cameo. Boba Fett was back! His presence was just enough to excite fans without dispelling the intrigue around the character. It worked for the time. Then George Lucas released the prequel trilogy. 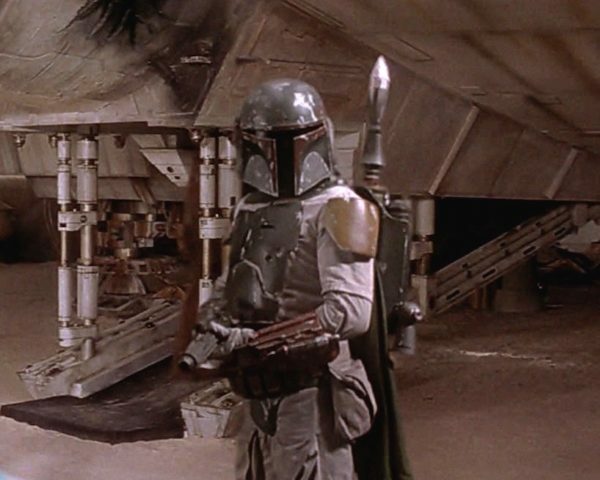 Attack of the Clones included an even earlier appearance of Boba Fett. Of course, he was the clone and “son” of Jango Fett. Many considered Jango the best bounty hunter in the galaxy for his time. Boba was merely a child during Attack of the Clones. Unfortunately for Jango, he met his demise by the electrum lightsaber of Mace Windu. The last image of Boba Fett came after the arena duel as he crouched down while clutching his father’s helmet to his head. Consider the Star Wars saga in episode order. If you viewed each movie in that order, and knew nothing of the events of the subsequent movies, what would you think upon seeing Boba Fett in the special edition of A New Hope? For one, you couldn’t be certain that was Boba Fett. It is a guy in Mandalorian armor similar but not identical to Jango’s armor. The color scheme is different and pieces are missing. You might suspect that it was Boba Fett, but you couldn’t be certain (we’ll leave The Clone Wars out of this for now). He isn’t named in the film. Wouldn’t this have been something that piqued your curiosity for later films? If the movies had been released in episode order, I believe that is one of the plot points fans would have pondered for three years between A New Hope and The Empire Strikes Back. Whether fans now like the special editions or not, they reignited the Star Wars fanbase back in 1997. Although then still popular, Star Wars was emerging from a dark period. The special editions gave fans a chance to relive Star Wars on the big screen, and as the Coffee with Kenobi introductions says, it gave many fans a chance to see Star Wars on the big screen for the first time. In addition, the special editions signaled to Lucasfilm that people wanted more Star Wars. I have both my personal and artistic reasons for including the special editions among my favorite moments. What do you think? I’m glad to know others are speaking out in favor of the Special Editions. I was 20 and had watched the THX VHS versions more times than I could count, but never saw them on the big screen. I bought in to Mr. Lucas’ ideal of finally achieving the vision he originally had. I also recognized at the time–and others seemed to forget–that Mr. Lucas was most often concerned with the medium of film, not in the story itself. Everything he did began and ended with technological innovation, the exploration of Campbellian monomyth was simply application of a structure that would be accessible to general audiences and speak to themes he found in the serials of his childhood. It was a vehicle of whimsy to see what he could accomplish.